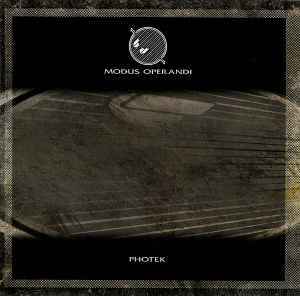 © 1997 Virgin Records Ltd.
Photek's debut album, MODUS OPERANDI, blew open the doors of drum & bass, with its crisp production and experimental nature. Kicking off with the jazzy "The Hidden Camera" (reprised from the EP of the same name), he shows off his skills at creating moods. "Smoke Rings" continues the darkness, upping the tempo, while "Minotaur" echoes with some reverberating metallic tones. "Aleph 1," on the other hand, goes in a more digital direction, bleeping itself into life as the strings cling to the background ("124" seems almost like a mellow reprise of "Aleph 1"). The chilly abstraction on display here gives almost an IDM spin to these tracks, like the Aphex-like texture that kick off "Axiom." And while he might have a little over-reliance on some sounds (such as the squelches on "The Hidden Camera" and "Trans 7"), when he brings his abstraction to bear on the jazz-and-R&B-tinged title track, it works wonders. Dark, twisted, freezing, atmospheric drum & bass experiments. Groundbreaking at its time, still a masterpiece.